Crumbly on the outside, chewy on the inside. Made of healthy, wholesome ingredients with zero compromise on taste – sound like it’s right up your alley? 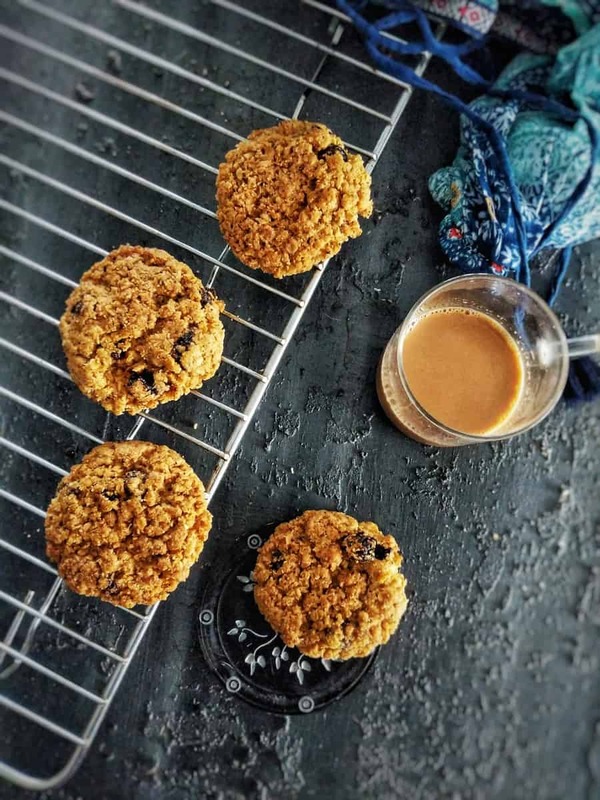 Make a batch of these easy-peasy cookies for your tea-time indulgence, pack them in your kids’ lunchbox, dunk them in milk and call it breakfast, even – these are THAT healthy and tasty too. Did I mention gluten-free? These cookies were first made as a part of recipe testing. I made a batch of 12, sent across a few for testing, and the rest were devoured away by me and others around in sheer amazement of how delicious they were. Over repeated batches, I’ve learnt that oats to cookies is what miso is for soup! 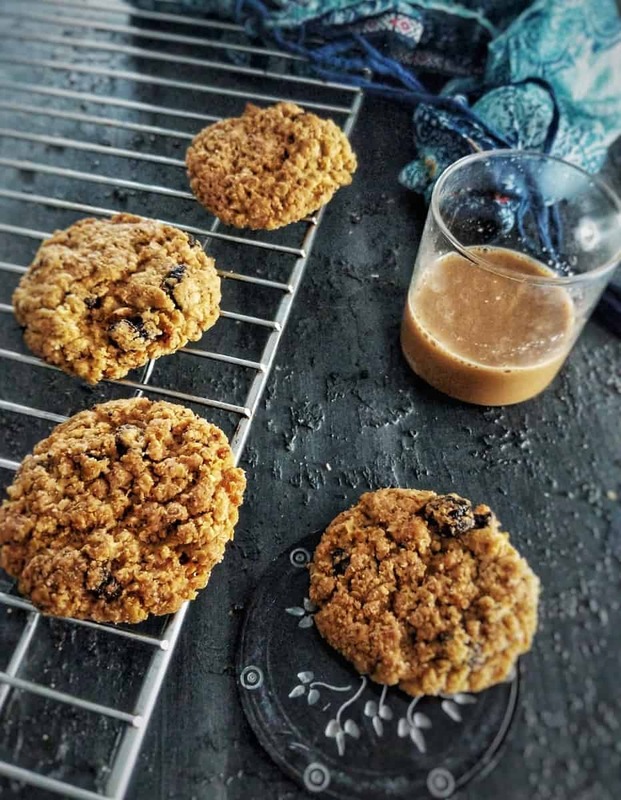 Oats render this rather obvious crumble and crunch to the cookie, while keeping the insides soft and slightly chewy, just like a cookie ought to be. The gluten-free part is also a by-product of recipe testing – I was looking for ways to substitute the glutinous ingredients like whole wheat flour. The addition of red rice proved to be a real winner – the peculiar red color can be attributed to anthocyanin, rich in antioxidants. Partially hulled red rice variety can provide up to 10% of your daily fiber content, along with a host of B vitamins, Iron, Zinc, Manganese, Potassium, Molybdenum and Magnesium. It is especially hailed as a wonder food for keeping heart diseases at bay due to rich mineral content and diabetes under control owing to high fiber content. Red rice can work wonders if you’re trying to lose body fat too – a small portion can keep you fuller for longer hours, saving you from unhealthy cravings. If you do not have red rice handy in your pantry and cannot locate it on the supermarket shelves, fret not – their caloric content is almost identical to that of brown rice, and can be substituted with ease. The best part about these cookies – these are free from refined flour/ gluten/ xanthan gum or any additives. You can make this dairy-free as well if you so wish, by substituting butter with oil or applesauce. Devour them on the days you have a sweet craving/ offer them to friends visiting you or even make these a part of your child’s lunchbox. These are packed with nutrition, have less sugar content, and the high fiber content serves to keep you satiated for a longer time, unlike the typical store-bought variety that’s saturated with refined sugar and flour and hardly offers any real nourishment. I use palm sugar instead of refined/ white sugar for its lower Glycemic Index, which does render slightly golden brownish color to the final product. If you prefer your cookies to be of a lighter hue, you can use white sugar instead. Pre-heat the oven at 175° C (nearly 350°F). Whisk together all the dry ingredients, i.e. flours, baking soda, baking powder and cinnamon powder in a bowl. Whisk butter at medium speed in stand mixer or using handheld mixer, until fluffy and airy. Add sugar and whisk at low speed for about 5 minutes until fluffy. Add dry ingredients in parts as you whisk. Scoop the batter onto tray, keeping optimal distance between each cookie, and transfer into the oven immediately. Bake at 175°C for about 20 minutes, until they’re firm on the outside and golden-brown. Remove the tray from the oven and allow to cool on a wire rack for an hour. Transfer into an airtight jar. These cookies can be stored for up to a week in an airtight jar. *Recipe is for 12-15 cookies; all values in grams.